The electric vehicle (EV) market is the fastest growing segment in the industry rising to an all-time high of 2.3% of all new vehicles sold up until the end of July 2018. The number of electric vans on the roads is expected to rapidly increase as the sale of diesel vehicles continues to fall and new legislation penalising traditionally-fuelled vehicles comes into force. WHAT IS AN ELECTRIC VAN? Simply put, an electric van is powered by an electric motor rather than a petrol or diesel combustion engine. The batteries store energy which is used to power the motor and turn the wheels. Just like any other electrical device, it needs to be charged when the battery is running low. The charging time for an electric van varies depending on how much charge is left in the battery and what type of charger you're using. You can use a domestic 13-amp three-pin plug - the same one you use to charge your phone - but this will take just short of 24 hours to get a full charge from empty. Alternatively, the recommended method is to use a 32-amp 'wallbox' charging station which can be installed at home or your office. This will greatly reduce recharging time to around 8 hours; you can plug your electric van in every evening to charge it overnight so that it has a full battery every morning. You can even find a rapid charging station while you're out and about if you start to run low which can deliver up to an 80% charge in just 40 minutes. The charging infrastructure throughout the UK is growing every month with charging organisations pledging to input thousands more charge points in the next ten years. WHAT ARE THE BENEFITS OF OWNING AN ELECTRIC VAN? The biggest obstacle to electric vehicle ownership is range followed by the charging locations available and amount of time it takes to recharge the battery. ​The UK government has committed millions of pounds into the research and development of electric battery technology to overcome this problem and increase the number of people switching to electric vehicles. In fact, new registrations of electric vehicles have risen from 3,500 in 2013 to a massive 116,000 as of August 2018. On average, there have been 4,800 EVs registered every month in 2018 which is a significant increase compared to 4,000 in 2017. It's clear that electric vehicles are growing in popularity as the technology gets more sophisticated and new legislation seeks to reward ultra-low emission drivers. The Congestion Charge is set to be joined in April 2019 by the Ultra Low Emission Zone which will operate 24 hours a day, 7 days a week. The only way to avoid being hit with both charges is to opt for an ultra-low emission vehicle - meaning a vehicle that emits less than 75kg of CO2. If you consistently drive into London, or only need to drive around 100 miles a day or less, then it seems like a no brainer to make the switch to an electric van for your business. WHAT ELECTRIC VANS ARE AVAILABLE? Several manufacturers have already started developing electric vans including the Peugeot Partner Electric and Citroën Berlingo electric. 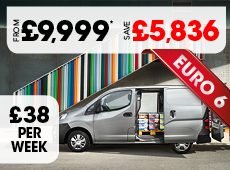 The two leading electric vans on sale in the UK are the Nissan e-NV200 and the Renault Kangoo Z.E. You can find out more information about both of these models by clicking on the images below.